This program is distributed in the hope that it will be useful, but WITHOUT ANY WARRANTY; without even the implied warranty of	MERCHANTABILITY or FITNESS FOR A PARTICULAR PURPOSE. See the GNU General Public License for more details. You must be using Windows Vista or Windows 7. The gadget needs an Internet connection in order to operate - it does not have to be an "always-on" connection, but you must be connected to the Internet when the gadget is first loaded. 1: If an instance of the gadget is already running, close it first. (Right click -> Close gadget). 2: Left click the download link above and choose "Save" when prompted, and save to a folder on your PC. 3: To install the gadget, simply double click the file in the folder where you saved it in the previous step. The gadget has not been digitally signed so you will be prompted with a warning before installing. It is safe to ignore this. 4: If upgrading, you will be warned that the gadget has been modified since you last used it. Click "ok". The gadget needs to know what your user ID is. Simply hover your mouse over the gadget and click the spanner icon. You can then enter your user ID. If you do not have a user ID, simply register for free. 5: When docked, the gadget will display just your credit and RAC values. To get a more detailed overview (as pictured above), undock the gadget (Windows Vista) or for Windows 7, hover your mouse over the gadget and click the "Larger size" icon. 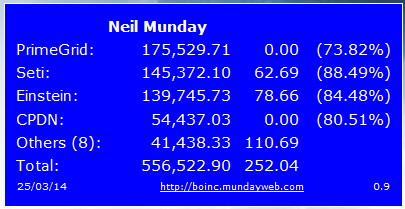 Currently the gadget will contact boinc.mundayweb.com for your stats every 2 hours. Please do not modify the gadget to increase the frequency of the updates as this will put an increased strain on my server and is not necessary as your stats are only updated once a day. 22/12/11 - 0.2 released. Includes bug fix for the handling for floats. The gadget will also notify you when a new version is available. 31/12/11 - 0.3 released. Includes ability to specify how many projects to show and dynamic height support. 01/01/12 - 0.4 released. Row spacing for projects condensed. 20/02/14 - 0.5 released. Re-design of the widget's layout and style which now allows custom colours to be used. 05/03/14 - 0.6 released. Now includes ranks and number columns are now right aligned. 06/03/14 - 0.7 released. Fixed alignment of total columns and colour of footer text. 11/03/14 - 0.8 released. Credit and RAC values are now comma separated. 25/03/14 - 0.9	released. Added setting to allow decimal places to be toggled on/off. 05/01/17 -	1.0 released. Changed feed URL to go direct to HTTPS rather than via CloudFlare's page redirect which was causing problems. Thanks to Gareth Lock for the heads up and for providing a fix. I would be interested to hear about any useful modifications you have made to the gadget. Let me know at [email protected].